BANGKOK (Thomson Reuters Foundation) – Activists, researchers and environmentalists from Myanmar and Thailand have been meeting on Friday to find a way to stop hydropower dams planned on Myanmar’s section of the Salween River, one of Asia’s last free-flowing rivers. Originating from the Tibetan Plateau, the Salween is Southeast Asia’s second longest river. It flows roughly 2,400 km through China, Thailand and Myanmar to the Andaman Sea, criss-crossing many of Myanmar’s ethnic minority areas, where it provides food and jobs. 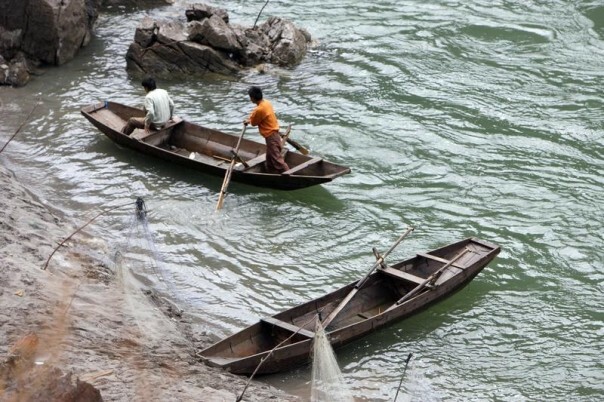 Campaigners say six dams in Myanmar, being developed jointly by Chinese, Thai and Burmese investors, threaten the future of local people and the rich biodiversity of the Salween basin. China is also planning 13 dams on the upper Salween. The Myanmar dams, with a combined power generation capacity of around 15,000 megawatts, are also located in former or current conflict zones. This has raised concerns of renewed or increased fighting between the army and ethnic rebels over natural resources, undermining ongoing efforts to achieve nationwide peace. Myanmar’s powerful military is also involved in the dam projects. Growing militarisation, illegal logging, land grabs and forced labour already affect communities in the dam areas – and those who voice opposition are threatened, say Shan and Karen campaign groups. In addition, most of the electricity produced would be exported to China and Thailand, leaving little for energy-starved Myanmar, while ethnic minorities who are already marginalised would be left with a degraded river and environment. “There is no local participation, no transparency and no benefit to the local people. The dams just lead to more fighting and human rights abuses, and villagers have to relocate,” said Sai Khur Hseng, general secretary of Ethnic Community Development Forum (Burma), an alliance of ethnic organisations across the country. “How do you measure the value of what all the people are relying on? You cannot measure the value of culture, religion (or) biodiversity,” added Khur Hseng, who is also coordinator of the Shan Sapawa Environmental Organization. Partly due to its remote location, the Salween River is less well known and populated than the Mekong, its big brother. Still, 6 million people, mostly ethnic and religious minorities, live in the Salween watershed and depend on the river for jobs and nutritious food, according to WWF. These minorities are already neglected in China, Myanmar and Thailand, said Pianporn Deetes, campaign coordinator for environmental group International Rivers (IR) in Thailand. “There is no spotlight on the area and it’s easy for investors to exploit it. The voices of the marginalised ethnic (people) who will bear the cost of the dams are not heard,” she said. A petition with over 33,000 signatures calling for a halt to the dams was released on Mar. 14,the International Day of Action for Rivers and against Dams. Campaigners also raised awareness during the ASEAN People’s Forum in March, an event bringing together civil society from the 10 countries that make up the ASEAN regional bloc. In September 2011, Myanmar’s President Thein Sein suspended the Chinese-led Myitsone dam, Myanmar’s largest hydropower project, after weeks of public outrage. Myitsone is located at the source of the Irrawaddy River, considered a lifeline for the country. “For the ethnic groups in the east of Myanmar, the Salween plays the same role as the Irrawaddy,” said IR’s Deetes. Carl Middleton, a former campaigner with IR who now lectures at Bangkok’s Chulalongkorn University, said it was “highly likely” people living along the Salween would be worse off after the projects – both materially and culturally. “While promises are often made from dam developers to support affected communities, the track record in the region for livelihood replacement programs is not good,” said Middleton, who is organising a research conference on the Salween in November. Given that the Salween dam deals were signed with the Burmese junta, who ruled the impoverished Southeast Asian country with an iron fist for almost half a century, Myanmar’s new quasi-civilian government should reconsider them, campaigners say. There is no river basin authority and no agreement between the countries on how to develop and sustain the river, however, and activists are now mulling a legal challenge. In June, a Thai court accepted a lawsuit against the government-owned Electricity Generating Authority of Thailand (EGAT) and four other state bodies for agreeing to buy electricity from a controversial hydropower dam being built in neighbouring Laos. Activists say the Xayaburi project threatens the livelihood of tens of millions who depend on the river’s resources. “Even if we cannot stop the dam, even if they find other buyers or funders, it’s unprecedented that transboundary impacts are now officially recognised. We’re working with the same group of lawyers to prepare similar stuff for the Salween dams,” said IR’s Deetes. EGAT’s international arm is involved in at least two out of the six planned Salween dams in Myanmar.